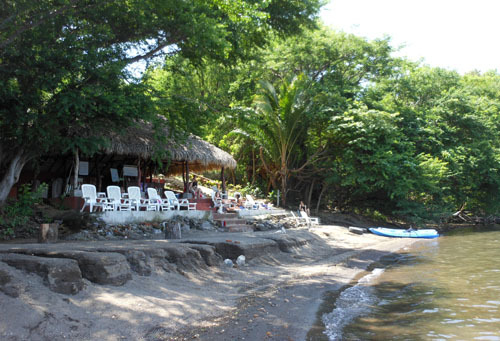 A short 30 minutes drive away from Granada is the pretty crater lake of Apoyo. The easiest way to get there and back is via the shuttle service offered by Hostel Oasis in Granada which takes you to the Paradiso hotel at the lake. You can choose to either visit the lake as a day trip or stay overnight. There are plenty of places to stay at the lake and if you want to stay elsewhere you can also get to the lake by a combination of bus and taxi. The bus will drop you off at the entrance and then either take a taxi or local car to the actual lake, a further 3 km away from the main road. If you want to relax for a few days then stay there but if you just want to see the lake then a day trip is probably enough as each resort has its own dedicated area along the lake and outside of that there is nothing much to do in the area. The lake has sulphur and other minerals which makes it good for keeping mosquitos away allowing you to relax without the need for bug spray. The water itself is generally warm to ridiculously hot in some places, and with virtually no waves it is an ideal place to swim. If you opt to take the day trip with Oasis then your $6 entrance fee to the lake is included in the $12 price ($10 if you’re staying at the hostel), plus you also have free kayak use at Paradiso which makes it pretty good value.